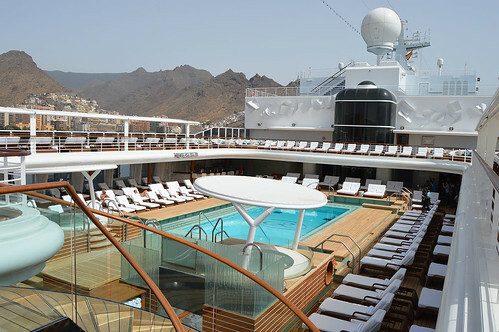 If your aspiring to be the World’s most luxurious cruise ship, being 54,000 tons, 223 metres long, and costing 450 million dollars is just a start. 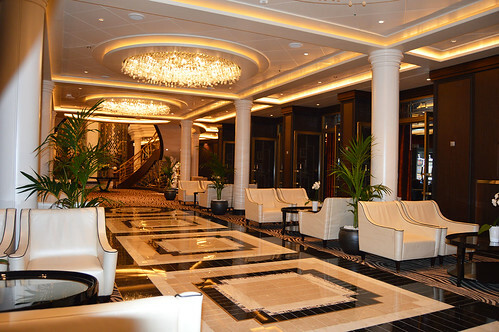 Seven Seas Explorer prides itself on attention to detail and those added flamboyant touches. 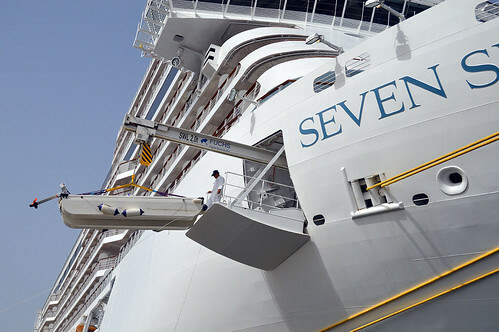 As the 14 decks loomed over me on Santa Cruz dockside, its lower hull was being power sprayed and roller painted to ensure it looked as good as when it was launched in Monaco barely two months ago. 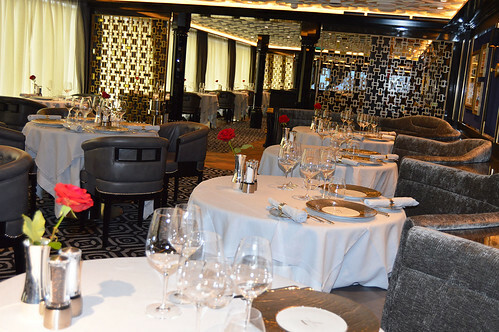 Where the new addition to the Regent fleet scores biggest is on personal attention, 750 guests is a modest number for top cruisers these days but with 540 crew, service is prompt, and I soon noticed, delivered with a chatty informality rather than curt efficiency. 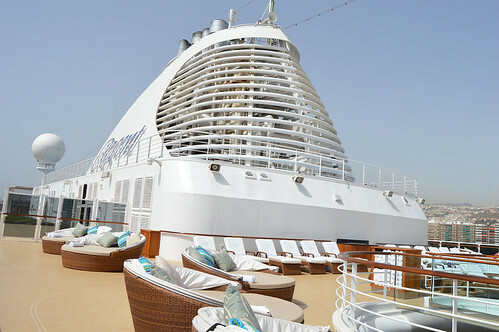 There are no cabins on this ship, just 14 different categories of suites, all with larger balconies than their rival companies. Captain Stan de Lacombe hosted a small gathering in the 11th deck Observation Lounge with its low sloping ceiling, a central dance floor, and a highly varnished grand piano with Santa Cruz harbour wall and the open sea stretching ahead through the large wrap around windows. 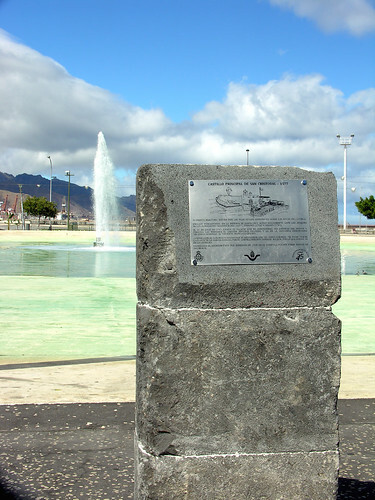 The French born captain referred to happy memories of his only previous visit to Tenerife 15 years ago when he hired a car and explored. 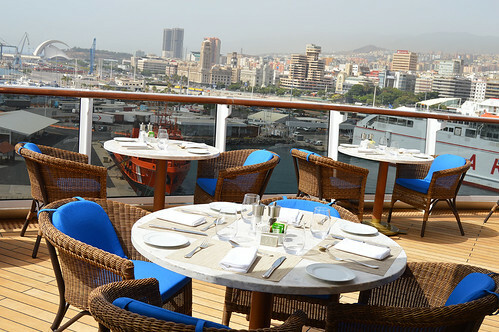 I was itching to see more of the ship, our guide led us past the Culinary Kitchen where guests can take lessons in regional cuisine, the ships excursions also include a chance to sample local specialties at each port. 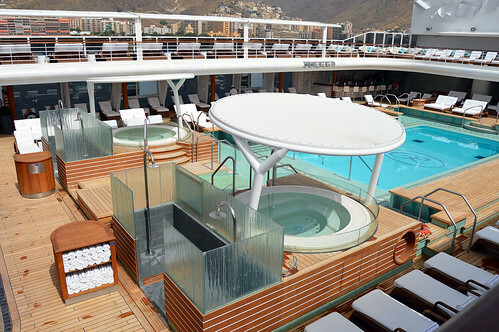 There were 13 different Tenerife excursions on the form I picked up, most of the guests and many of the crew had poured off the ship earlier so the large pool and Jacuzzi area was fairly quiet. 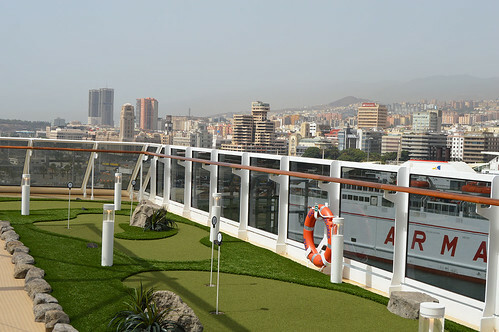 On the top level they have a golf putting green , shuffleboard, and even a tennis court. For the less energetic there are plenty of rest zones or the outside terrace of the La Veranda café, even with the heavy calima hanging over the capital, Santa Cruz was looking good down below. For those taking a break from the sun, the library further down the ship offered deep luxurious leather chairs for a spot of reading. 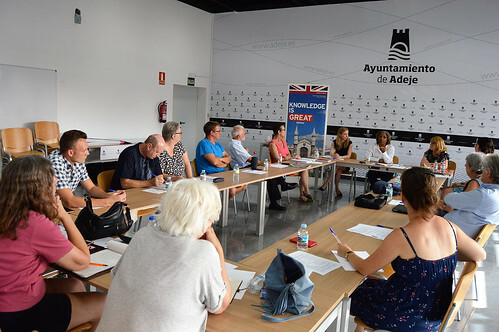 Someone had put a lot of effort into printing off and clipping together the recent days newspapers like New York Times, The Washington Post, and London’s The Times, pointers to the dominant nationalities among the guests. Foodies have plenty of choices, Prime 7 offers an America steakhouse menu with subdued lighting, Frank Sinatra was crooning via the speakers when I popped in, and a floor to ceiling wine cabinet along one wall promised a vast choice. Art is a prominent feature all over the ship, in Prime 7 they can boast three Picasso’s. 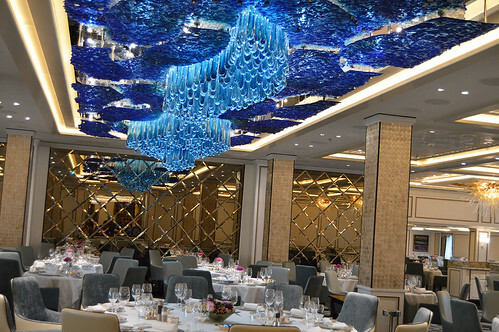 Compas Rose is the main dining area, chandeliers are another ship wide feature and here they have a sea blue wave complimented by golden sea urchin clusters. 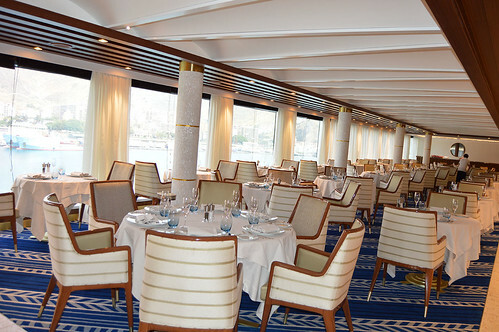 Dinner services offer another touch of class, the plates in Compass Rose are designed by Versace. 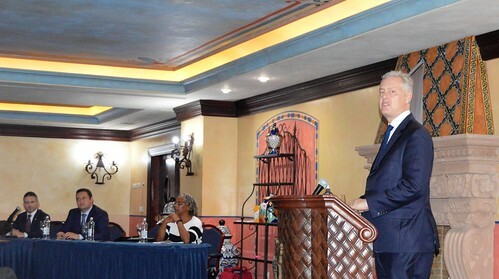 Our guide dispelled any thoughts of restrictive dress codes “we are fairly informal beyond no jeans, shorts, and flip flops, jackets and ties aren’t required but many guests choose to make a big effort to match the setting of the Compass Rose”. Here come those chandeliers again, the two floor reception lounge with it’s sweeping staircases is centered around a glittering teardrop of light and glass. Other lounges connecting the main distractions burn brightly with opulence reflected in the intricately tiled floors. 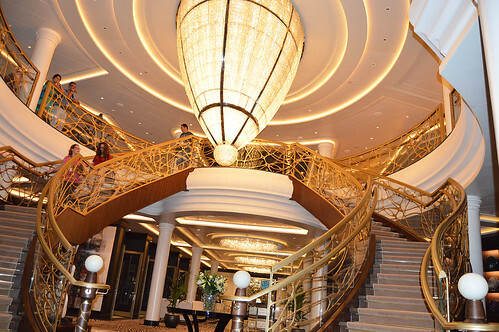 With so much daytime shore leave the ship bursts into full social mode in the evening, the Constellation Theatre with lavish shows and the casino with the lure of the tables are just some of the diversions. 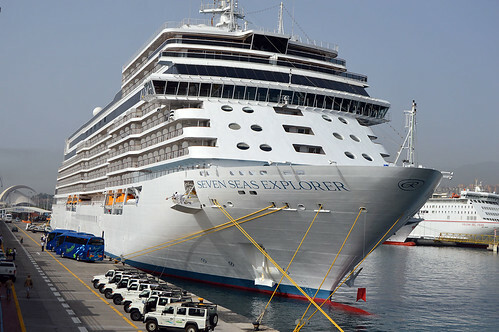 I know your wondering how much all this costs, I couldn’t find a price guide for this part completed 11 day cruise from Lisbon to Barcelona but a future nine day voyage popped up on the net from 3,999 dollars. 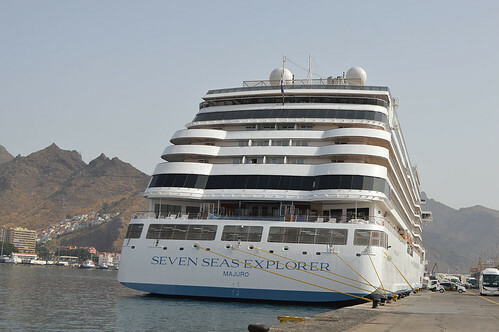 If you want to find out about future cruises and booking go to https://www.rssc.com/ships/seven_seas_explorer/ . Lanzarote was next stop on the schedule for this grand lady but I’m sure she will be gracing Tenerife with her stylish prescience soon. 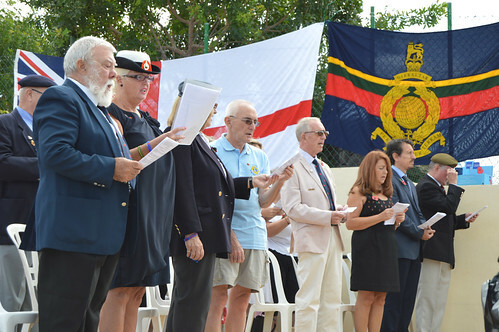 The years passed and the miles traveled focused the memories at the British Legion remembrance service at Westhaven Bay, Costa del Silencio. Uniforms, medals, and flags reflected conflicts around the globe involving British servicemen, it’s 100 years since the outbreak of World War One but the determination to remember all those who made the ultimate sacrifice is as strong as ever. 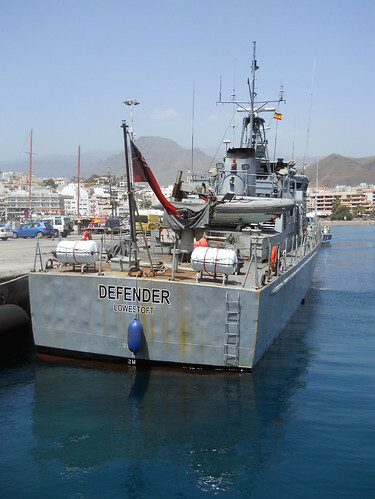 The work of the British Legion is always relevant with many of the armed forces still active in current conflicts. 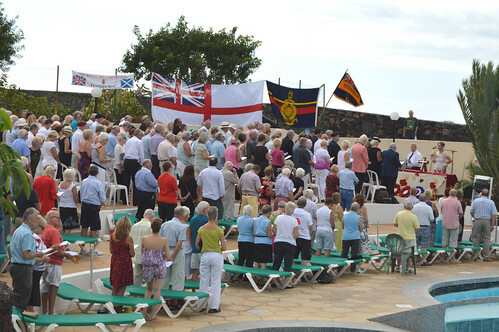 The Tenerife branch are very active, the Noel Rogers trophy at the alter is a testimony to their position as the biggest fund raiser among the legion’s overseas groups. In between the hymns and prayers the several hundred gathered for the service dug deep to fill the collecting boxes. The holiday complex setting around the pool made an informal but easily accessible venue and the views out across the sweeping bay added a glorious reminder of foreign shores that will live on in the memory. 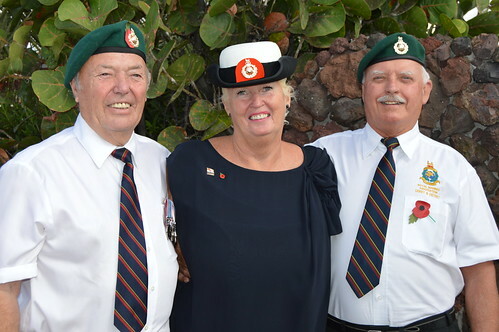 Although the act of remembrance is a solemn service there were many smiles among the tears as old comrades were remembered and newer friendships were made. 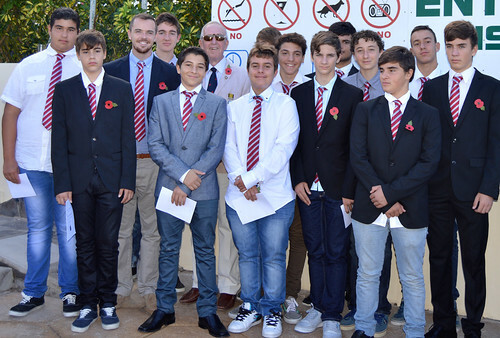 The lessons of war are still being learned by a new generation so it was good to see a multi national group of under 16 rugby players from the Nandu club from Adeje in attendance, their welsh coach Jamie Whelan is himself a former serviceman. 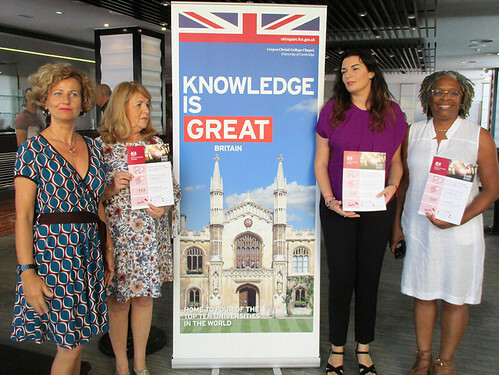 The act of commitment was read out in English and in Spanish. 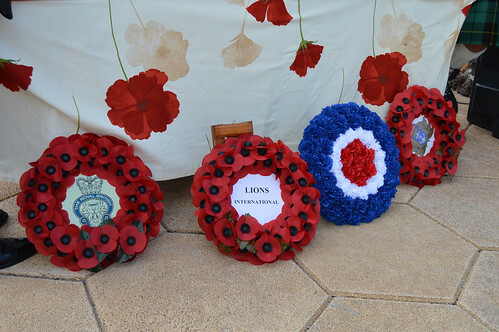 The Lords Prayer, Abide With Me, and The National Anthem were all observed immaculately, as was the laying of the wreaths at the alter. The bugle call of The Last Post by Jo Cassidy hung in the air and paved the way for the two minutes silence, a time for reflection, pride, and sadness. The only sound was the gentle lap of the tide in the bay. 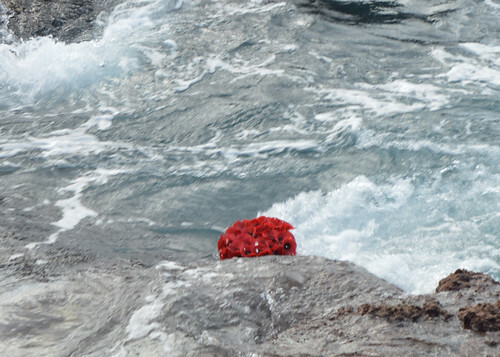 Former marine Rick Sweeney then led a small group down to the rocks for a wreath to be placed in the water. 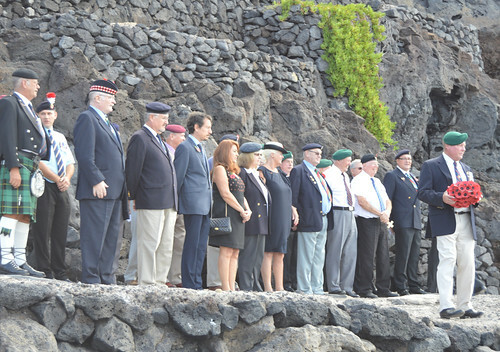 It was a very moving service and a fitting tribute to those who fought for their country. 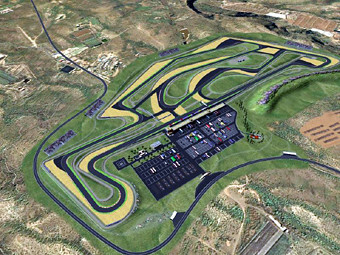 There are some big, bold projects on the starting grid for Tenerife, none more so than the motor racing circuit at Atogo, San Isidro in Granadilla de Abona. 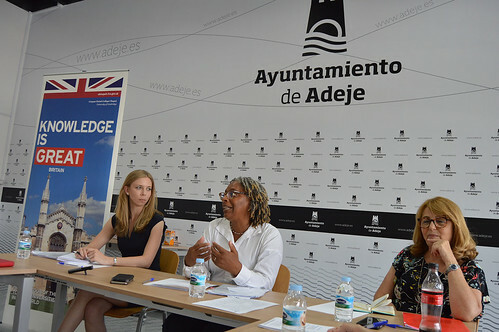 My early morning destination was Adeje for a press conference update on the long proposed project and the Fleetwood Mac Grand Prix music was steering around in my brain. 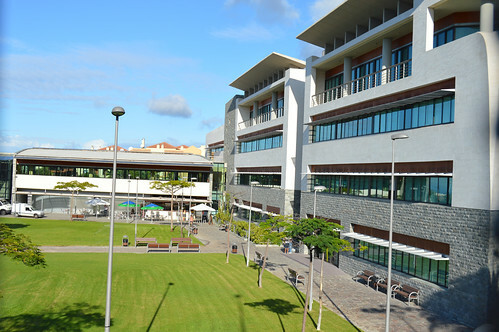 FIT Canarias, the factory for tourist innovation was the very impressive host, the bright white office spaces are a relatively new tenant in the CDCTA tourism development complex at El Galeon. 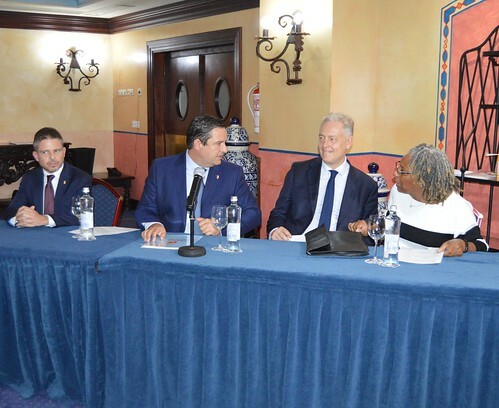 Eduardo Pintado Mascareno, the legal councilor of commerce for the Tenerife Cabildo (government) spoke at length and with some passion about the planned track and the benefits it would bring to Tenerife. 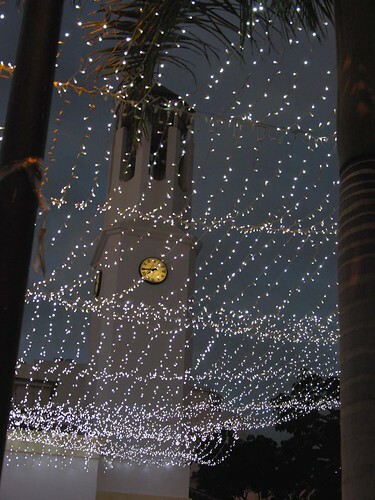 Basically it’s taken a big push to get the idea to the stage where all the layout and technical designs are ready, the Cabildo has given its blessing to the project and just the difficult subject of finance has to be conquered. 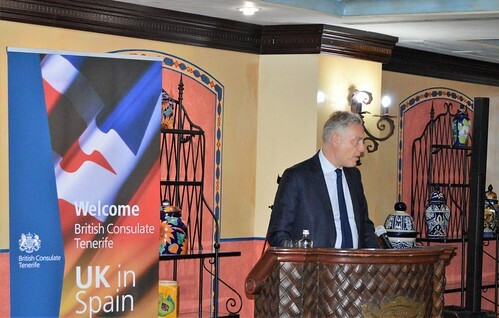 Tendering is open for the 30 million euros investment needed and we were told there is strong interest. 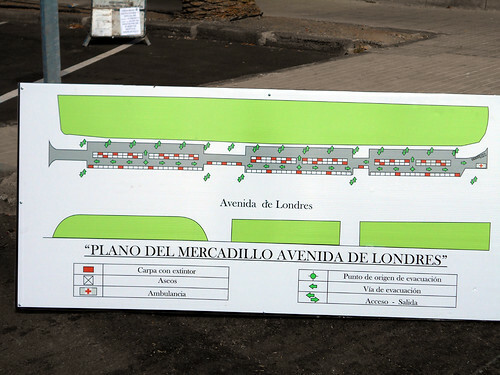 The Cabildo has always said it would chip in with the supporting infrastructure links, the south airport is just 2.5 kms away and the TF 1 motorway passes nearby . 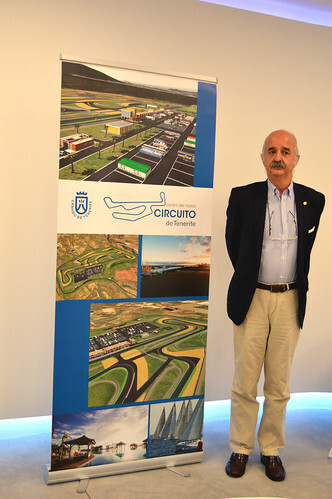 Of course the question of Formula One racing was raised again, the councilor said that would be the dream aim but realistically they were looking at top European racing at several levels on four and two wheels. 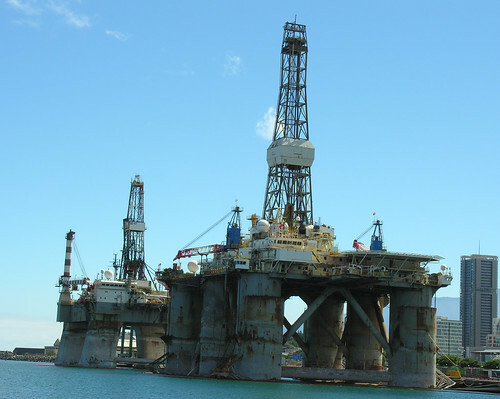 You can take an in depth ponder at the special website, it’s a long term project that will take at least two years to build once the first digging starts but with a lot of faith and imagination you can almost smell the engine oil. Back out in Adeje I was shocked to see an old favourite missing from his post. 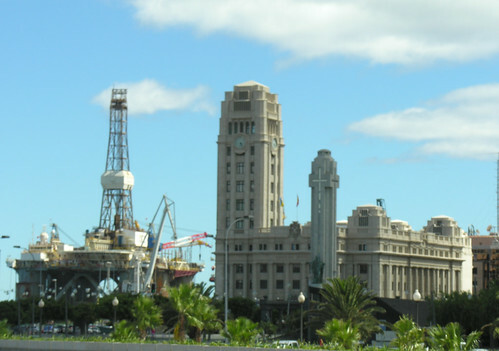 The statue of the Guanche warrior was no longer perched on his plinth on the way into the old town. Instead it looked like one of the cages for the Christmas lottery, El Gordo, had been given a prime position. 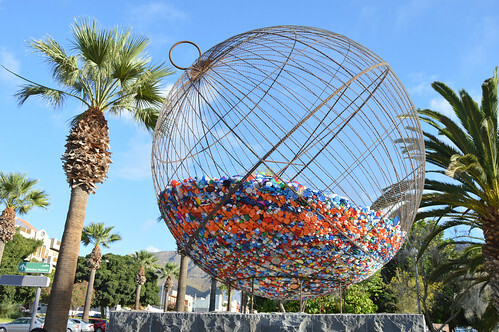 Closer inspection and the help of some information boards revealed it to be a sculpture called Sphere Solidarity by Juan Antonio Hernandez containing thousands of used plastic bottle tops. 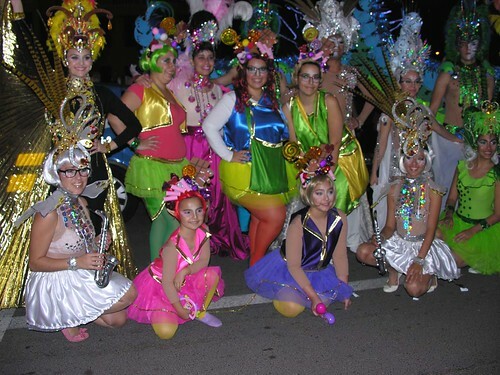 The promotion, Tapones Solidarios, aims to fill the container with the discarded poppers to help the charity Iraitza Association to recycle the tops and donate the proceeds to help people with physical or mental disabilities. You can help Adeje to reach its target by dropping off collections of the bottle tops near the sphere. They need to have the recycling mark on them for number two or five, if Dorada bottles had such tops I’m sure I could have a go at filling it in double quick time. 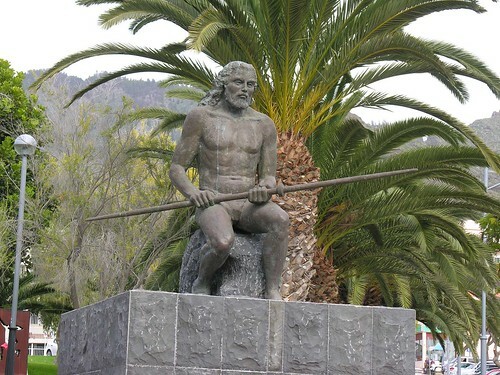 There was better news of the Guanche statue, he wasn’t guarding a fish pond in a councilors garden or being used as an advertising gimmick. Further down the hill I could see him partially obscured as he was being fixed into place on a large traffic roundabout. I’m sure he would approve of the cause. 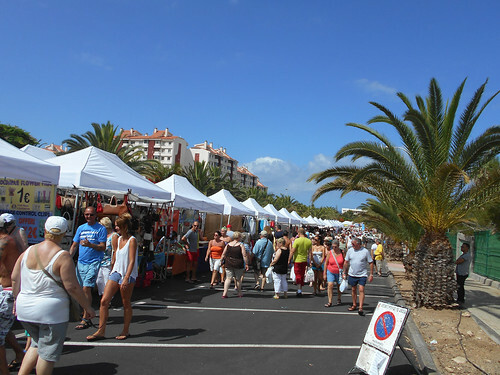 Some might call it an ill wind that has brought some good and some would say it’s a welcome wind of change but either way Avenida de Londres is the new home (at least for now) of the Los Cristianos Sunday market. 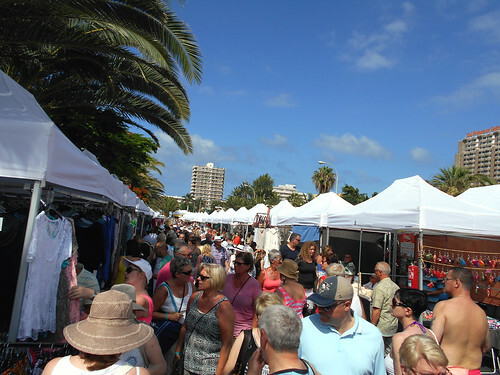 Even in the less scorching winter months the popular collection of around 600 stalls at the Los Tarajales end of the old beach could get very claustrophobic and sweaty. 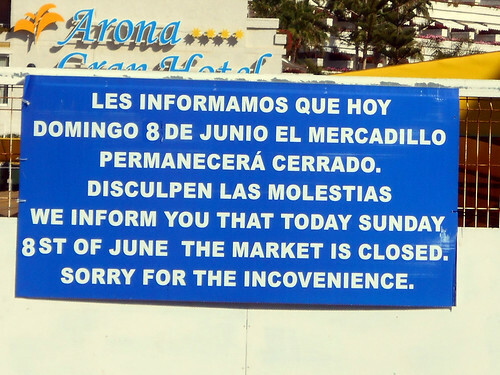 Rumblings of discontent from the Arona Ayuntamiento grew louder until the original market was shut down on Sunday 8 June 2014. There were so many diverse objections pitched up you could be forgiven for thinking the council just wanted it closed no matter what. 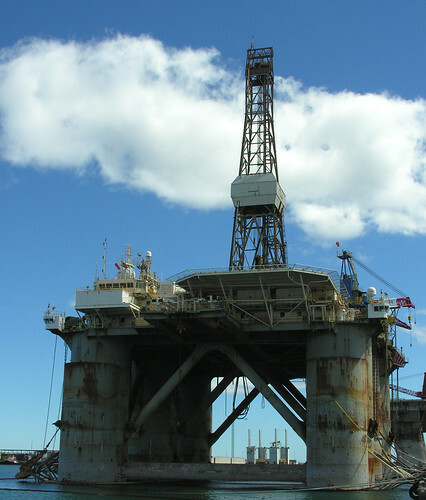 The trading area had reportedly spilled out over the original boundaries, there were health and safety issues over access, and inadequate toilet facilities, so the council claimed. After the closure many doubted it would return but a lot of hard work and lobbying by the organizers, including a demo outside the town hall, brought a swift compromise and last week (15 June) it reopened at short notice a short walk away going up the hill between the two roundabouts beside Victoria Court. So with the second week under way I nipped down for a look around, the first thing I noticed coming down the hill was an ambulance and a cluster of mobile toilets, clear signing, and wide spaces between the rows of stalls. It seems it would not just be the traders breathing easier. For those who haven’t indulged, it’s pretty standard fare, cheap replica fashion and sports clothes, watches, electronic gadgets, hats, and more Aloe Vera than you can shake a plant at. Everybody loves a bargain, particularly in these hard times, and it’s also the thrill of the chase, elbows working overtime as some good old fashioned rummaging takes place. 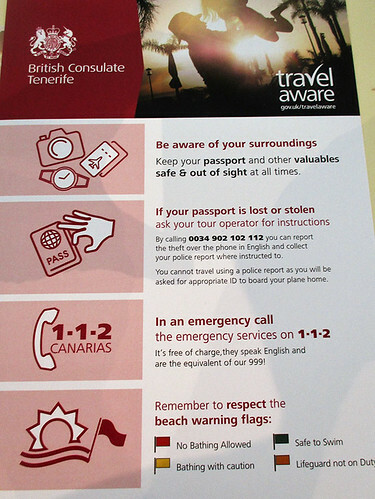 I expected to see bargain bins of Spain and England World Cup souvenirs, you probably couldn’t give them away now. It was so nice to be able to stroll up and down the stalls with room to perform a lavish musical number if you so wished. The breeze was very welcome and down each side there were breaks in the stalls so people could dip out at easily to grab the shade of the palm trees. Each intersection was clearly marked, there were market officials identified by their t-shirts to offer help, and one of the nearby apartment blocks was doing a roaring trade in cold drinks and snacks. I spoke to a few friends who were working stalls and they were pleased with the new set up, some of them must have sweated pounds off at the old site. They also told me that pretty much all of the former stall holders had got themselves a new pitch. The only cloud on the horizon is the uncertainty, they have a provisional agreement for 6 months but there is still talk of returning to base camp or being closed again. 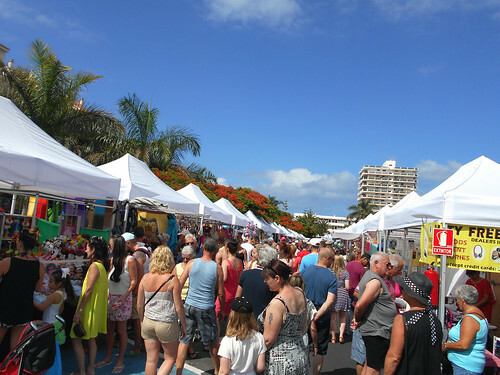 With less than a year to go until the local elections, councilors are trying to be all things to all people, and will be keen to please the various nationalities working the stalls and also keep local bars and restaurants happy with their big boom day of the week. For now though it looks like an improvement to an outsider like me, you can check it out for yourself from 9 am to 2 pm every week. 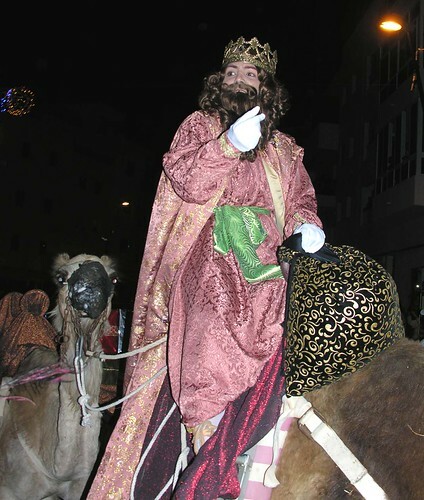 I nearly didn’t go to the Three Kings parade in Los Cristianos – well it’s always the same – isn’t it? They caught a lot of people out this Reyes Eve by changing things around, call me an old stick in the mud but I thought the early part was chaotic, I don’t like change, I’m still reeling at having seen two currency changes in my lifetime. It was past the advertised start time of 7pm, but that’s expected, and people were milling about looking for a sign from the east – or anywhere really. Normally the parade starts from the ferry terminal but this time the ringing of a ships bell and bright lights heralded the arrival of a small ferry boat by the old fishermens quay. 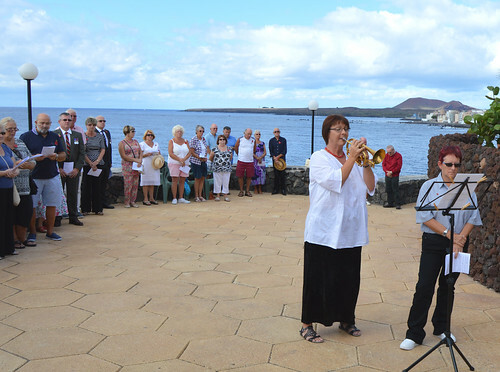 The Arona brass band was assembled beyond the guarded gates and the Kings had arrived off the ferry but there was no sign of camels or the other cartoon characters, jugglers, etc. 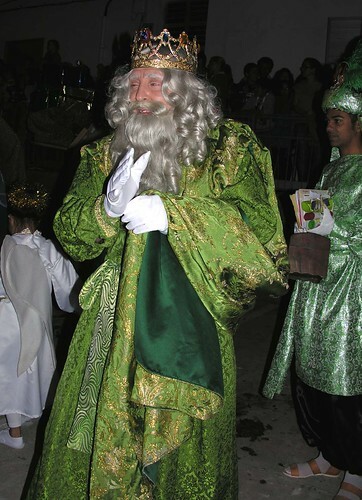 A path was cleared along the quay as crowds flocked over across the old beach and the band led the kings and their servants on foot down and around to the Plaza del Pescadora. The plus was the children could get up close to their heroes but the down side was many couldn’t see over taller people in front of them. Taking the passageway up at the back of the small plaza the master plan was revealed, the camels were parked up just below The Devon Arms and their many magical friends were dressed up and waiting. I didn’t see the kings at first and assumed they had popped in for a Guinness but they soon appeared and saddled up. It’s a tight area and those camels were parked bottoms outwards so everyone was trying to avoid any extra gifts not mentioned in the old tales. It was good to see the hairy beasts and I can’t remember when I have seen so many camel toes. 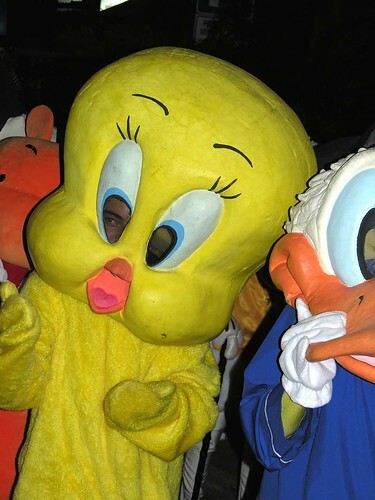 I was shocked to see among the cartoon characters a large Pio – but I bit my tongue and resisted the football chant reserved for this Las Palmas mascot. At the top of the steep slope the jolly parade turned up and into Avenida Suecia, back on the old original route, that was more like it, the Kings and their fellow paraders began throwing handfuls of sweets out to the crowds packing the pavement and people were able to see their royal visitors in their elevated position perched up on the camels. Along and past the gloriously lit church plaza, which had hosted bouncy castles and games earlier – they still think I’m too old for a bounce. The final stop was outside the cultural centre where the thrones were awaiting the royal bottoms and the children were awaiting their presents. As the paraders arrived I tried to get the Pio to pose with me for an Armada Sur caption competition but it was whisked away to the changing rooms along with Dora the Explorer, Sponge Bob, Tom and Jerry, and Snow White and her Seven Dwarfs, it must have been quite a clash of egos in there. 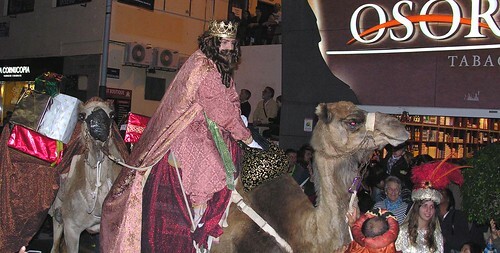 The big day Reyes (6 Jan) will be a quieter day for families to enjoy, hope everyone gets those special presents they really wanted. 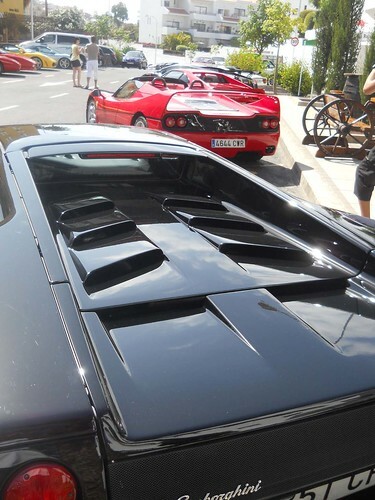 It was quality rather than quantity as a dozen Ferraris purred their way up Calle Berna in the heart of Los Cristianos at the end of the first Salida Ferrari parade. 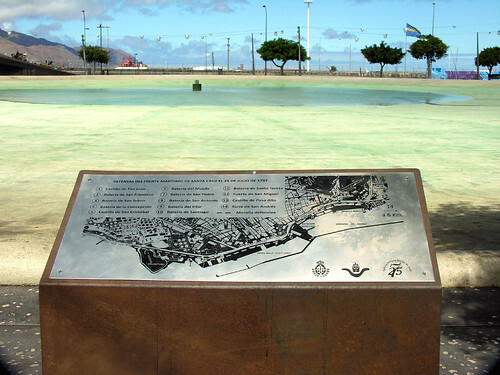 The route had taken them up to Los Gigantes and down the west coast via Alcala, Playa San Juan, Callao Salvaje, Playa Paraiso, Costa Adeje, and Playa de Las Americas. Slipping into their allotted parking spaces they were swarmed over by a small but appreciative crowd, advance publicity had been pretty ropey, I had expected a few more but maybe the crisis has taken its toll with a few being traded in for something more economical. There was no denying that they ooze class, the sleek lines and curves reduced several admiring men to quivering love struck teenagers. I tried to get a few nice young ladies to drape themselves over the bonnets but they seemed to think it was just a cheesey and desperate chat up line. 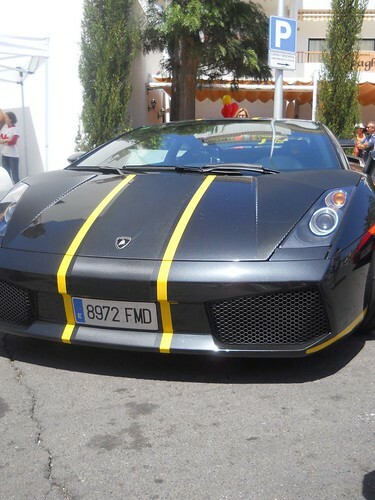 From Mondial to Lamborghini, and GTO to Diablo they attracted a steady stream of visitors through the afternoon. The Spaghetti House was doing a good trade as their terrace looks straight out onto the parking area, I noticed someone had parked a car at the edge of the area covered with adverts for massage services – well it’s all bodywork I suppose. Hopefully it will become an annual fixture with better publicity and more entrants. Another late addition to the social menu was an evening concert in the church plaza by AMAE, a local music, dance, and art academy. This wasn’t in any of the advance listings and the posters only appeared in the cultural centre the morning before so I wasn’t too sure what to expect. In the afternoon I passed the plaza and heard a band rehearsing, they were a mix of teachers and pupils and were playing Another Brick In The Wall by Pink Floyd. They were very good, the female singer had a strong voice and the guitarists wrung plenty of emotion out of their instruments. Popping back in the evening for the start of the main event I caught a band doing a rock and classical mix in front of a full plaza mix of seats and standing at the edges. These musicians were also top notch and there were plenty of young artists gathered in the backstage area awaiting their turn. I just had time to watch two dancers, Julian and Carlisle perform a lively routine to the Tina Turner track Rolling Down The River. 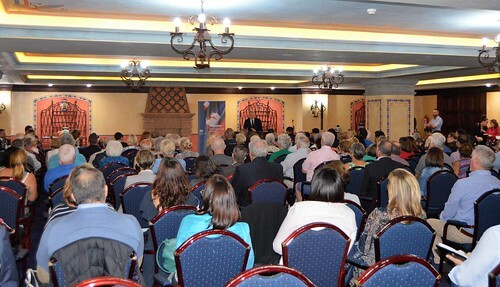 I shall be looking out for future events from AMAE, miles better than the no talent contest drivel that BBC and ITV serve up each Saturday night.